Take pressure cooker, add 2 small glasses of water and boil it. Cut potatoes into half and put it in the boiling water. Close the lid and pressure cook for 2 whistles. Let the cooker cool. Take out potatoes and let it cool slightly. Peel the skin and cut into small pieces. Cut green chillies from the top, cut into half vertically. Remove seeds and chop it finely. Take a pan and heat the oil. Add one or two cumin seeds to check if the oil it hot or not. If it crackles then it is ready. Add all the cumin seeds and let it crackle. Add curry leaves and green chillies and stir it for 2-3 times. Add potato pieces, salt, turmeric powder and mix it well and cook it for 1-2 minutes on low flame. Switch off the gas, the vegetable is ready. Garnish it with coriander leaves. 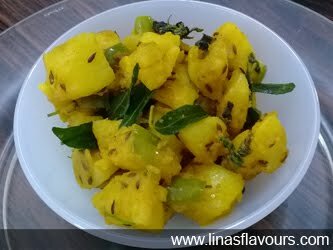 Serve it with roti or paratha.